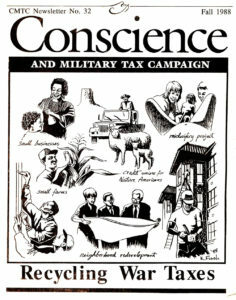 Welcome to another post in the Conscience and History series, highlighting some of the writing in the newsletter of the Conscience and Military Tax Campaign (CMTC), published from 1980 to 1995. So many of the discussions within the war tax resistance community are decades-long. When I first came to NWTRCC in 2008/2009, I got up to speed on the debate over the Religious Freedom Peace Tax Bill advanced by the National Campaign for a Peace Tax Fund… but it wasn’t until I read some 1980s issues of Conscience that I fully realized that we’ve been having the very same debate for decades. Another long-time debate within our community is whether war tax resistance is a movement. The following piece was written in November 15, 1988 and published in the Fall 1988 issue of Conscience. A lot of this discussion will probably look familiar. Share your thoughts about this piece and perspective in the comments! I’ve had occasion recently to talk and think a great deal about the war tax resistance movement. People have asked me to describe the movement, strategize about it, help plan its future. Our conversations and work have had a peculiar quality to them; we’ve had too much difficulty bringing our present and future hopes into focus. For the longest time I’ve thought I was fuzzy-headed, too tired, or otherwise defective in my thinking. But it’s finally dawned on me that we’ve had so much trouble because we’ve been talking about something that’s unreal, that doesn’t exist. War tax resistance is real, but the war tax resistance movement is fiction. Let’s start with what is real. First there’s war and militarism. Second, there’s government. Third, there’s taxation. Fourth, there’s witness and resistance. All of these are real, and I’m coming more and more to seeing that militarism, government and taxation are inextricably intertwined. Has there ever been a government that has not waged war and paid for it through taxation? No doubt the historians among us could find a few examples of non-warring or non-taxing governments, but only as exceptions to the rule. If you accept my rhetorical question as near to truth, then you can easily follow me to my second query: is government ever likely to legalize conscientious military tax objection? Until governments stop waging war, they will need military taxes. It would be tantamount to institutional suicide for a war-making government to allow its citizens to become conscientious war tax objectors. Since war and taxes are bound up in the essence of current governmental function, governments simply cannot allow individual citizens a choice to opt out of war payment. Of course this point of view raises serious questions about the viability of current peace tax legislation proposals. But it also points to another, more fundamental issue as well. The goal we have to adopt is to get governments out of the war-making business. We need to submerge our tax resistance work into the the [sic] larger peace movement because tax resistance is, after all, only a tactic, not a goal around which we can build a movement. It is not logical, practical or real to try to build a movement that is based on a tactic instead of a goal. It will not get us where we want to be, nor will it attract and motivate new adherents in the numbers deemed necessary for success. This doesn’t mean however, that we need to stop doing war tax resistance or even having war tax resistance groups. First, war tax resistance can be a useful tactic within the overall goals and strategies of the peace movement. Second, and I think most importantly at this stage, war tax resistance is a powerful witness. We have have to acknowledge that governments will be in the business of war for a long time to come, and that our peace movement work will have to be lifelong in planning and execution. But today at this moment, in this present time, we still have the power, the effectiveness, and the necessity of witness. War tax resisters may not change the system, but we at least don’t pay for it, and we stand in open and risk-taking opposition to it. To work this out in my mind, I’ve been thinking about the parallels between tax resistance and draft resistance. Anti-draft groups don’t bill themselves as movement that’s separate in any way from anti-militarist and/or anti-interventionist movements. Rarely do they try to recruit young men to resist the draft or become C.O.s. Rather, anti-draft work focuses on educating people about the perils of militarism and military service, and provides services and support to individuals who, based on their deeply held beliefs, become resisters or conscientious objectors. I’ve never heard of an anti-draft group that promoted a “symbolic” C.O. campaign. It is not easy to be a conscientious objector. It is probably inappropriate to “recruit” people to be C.O.s, and we can’t expect that most people will take that path in the foreseeable future. I believe that war tax resistance work should focus on supporting the witness of conscientious objection to military taxes and not on recruiting or trying to build a movement. We will still need our groups, some of our literature, our counselors, and our newsletters. If we stop trying to create a movement based erroneously on a tactic, we will be able to clearly focus on the wtr work that needs to be done. We can abandon mass outreach and symbolic campaigns and instead foster serious consideration among peace-minded people of the conscientious implications of paying war taxes. We can help what will probably be a relatively small group of people discern and understand the full implications of a life of conscientious objection and witness, and help them maintain their witness over the long haul. That work is real and worthy of our thoughtful planning, energy, and support. Betsey Ross is the pseudonym of a Seattle area war tax resistance counselor. Self-aggrandizement. As a fairly isolated WTR person for quite a few years, I have found myself promoting my civil disobedience frequently. Occasionally I have been told that people do not generally like self promotion and think less of people who engage in it. Mr. Trump is roundly disparaged for his self promotion. Is our effort to encourage others to undertake WTR seen as a way that we claim to be better than others? If we view ourselves as taking the moral high road, does that include looking down on others? It is most helpful to see how this writer clearly identifies four issues which belong to the war tax movement: 1) war and militarism; 2) government; 3) taxation; and 4) witness and resistance. Plenty of issues for a significant life long response of insight and compassion. What a great article…thanks Erica ! WTR is a grassroots movement.